I’ve used shutters before in room, and you probably saw them HERE. So I was wanting to give the farm some updates and I am trying to do something in every room. Here are the updates I’ve posted so far. And now onto the girls’ bedroom. I was ready for a change, and so I decided to put some old shutters behind the beds. 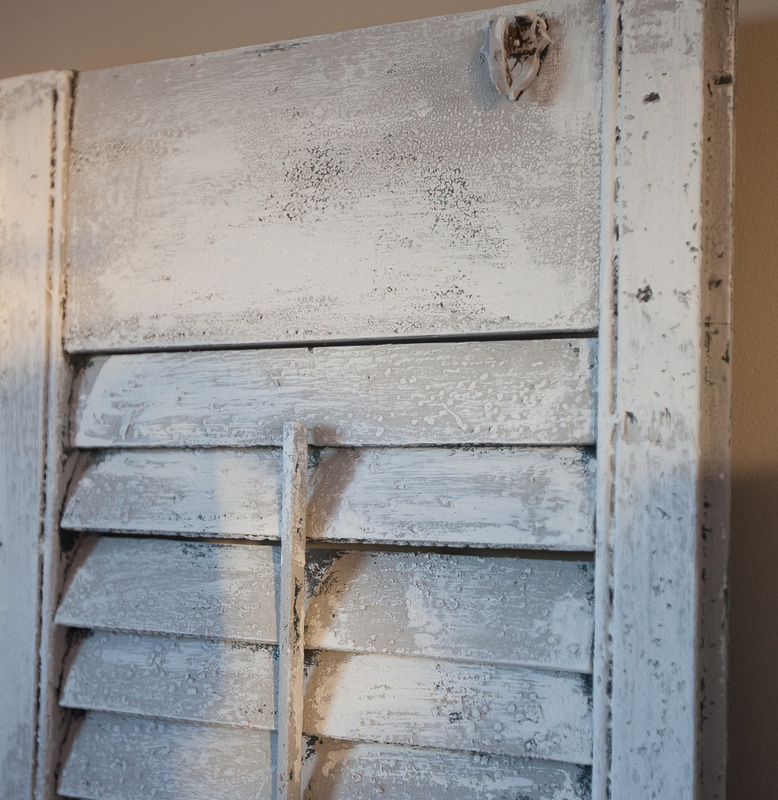 First I bought some very old shutters that were super dirty. After cleaning them, I painted them a very light gray color with chalk-based paint. I was going to wax them, but it was way too much trouble. I used a cream color as my base, then dry brushed with a cream paint on top. The shutters are so old they have loads of character and lots of bumps and bubbles. When dry brushing, you don’t load much paint on your brush, and the you lightly just brush the surface once, not trying to get the paint in every crack and crevice. That way the indented places keep the original color. See how the cram paint is only on the bumpy parts of the shutters? New month, new giveaway! 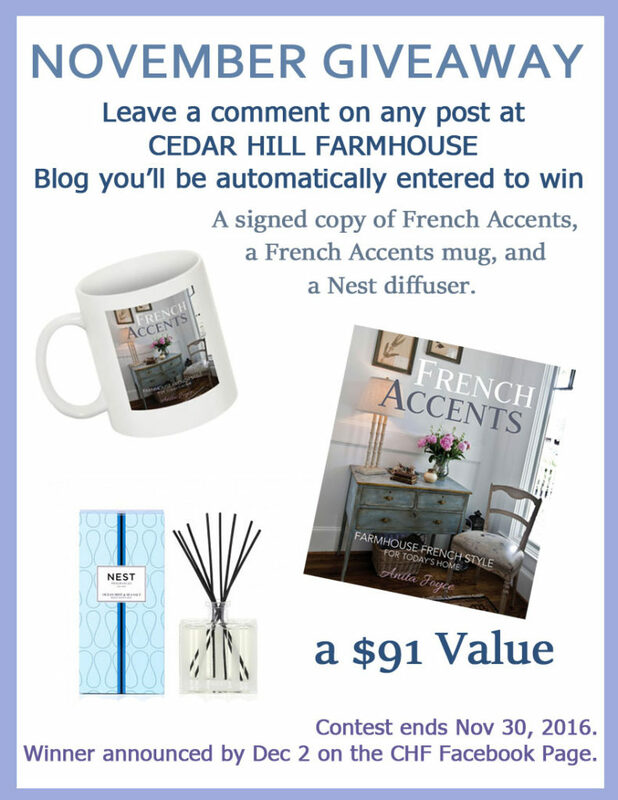 Every comment this month on any post at the CEDAR HILL FARMHOUSE Blog, automatically enters you to win!!! Details here. I painted 9 shutters! But it was a beautiful day, and I did all the work on my back porch, so I guess it wasn’t so bad. Here they are. I have removed the little dresses for now. I might put them back; I just haven’t decided. I loved the dresses, but sometimes you just need to change things. It seems like the shutters need some clip on reading lights. Not every shutter was exactly the same height. But that gives it more character, right? You could use brand new shutters to put behind a bed, but they wont’ have all of the texture that these do. So what should I put above the shutters? The dresses that were there? Artwork? Nothing? What do you think? Great look with shutter headboards…it has always been so hard to paint all the cracks and this is much better look. I do like the first picture with the tiny dresses. It gave me the idea to do that with my daughters christening dress. I’ve always used it but liked how you “framed” them…thank you. Very cute idea! I love the way you arranged the beds-so thoughtful! If only I had more daughters………. The dresses were so adorable, but I love the shutters too! You did an amazing job painting them. Two great looks! I don’t think I would put anything above the shutters. They stand alone beautifully. I love your girls’ room and what you have done with those beautiful shutters. You have a great imagination. Am spending a few days in Sweden. 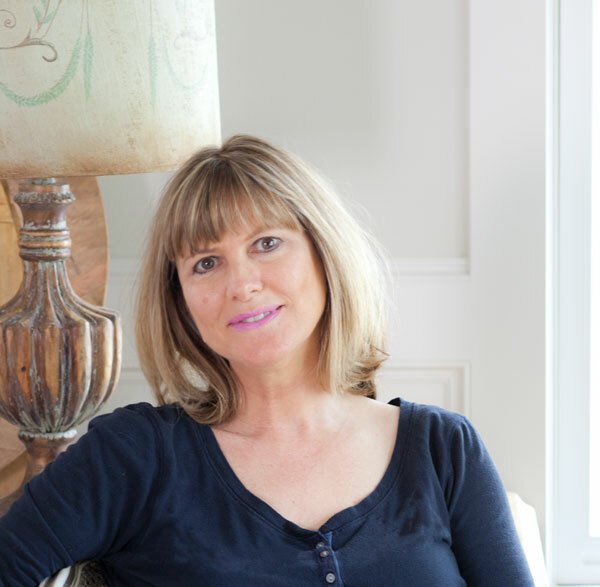 Some or your ideas have that lovely, homely, simple yet beautiful Scandinavian feel. The hotel we are staying in is more modern but still has that lovely cocky but beautiful family friendly atmosphere. That’s awesome, thank you for letting me know Christine. I certainly am inspired very much by simple Swedish design. Feel bad about the cocky. Meant cosy. That darn predictive text. Ha, I knew you didn’t mean ‘cocky’ Christine. I knew it was a typo, but wasn’t sure what you meant to say, so thank you for the clarification. Happens to me too!! Ooooh, these turned out perfectly. I love all the bumps and bubbles on painted pieces. So much character. I love the little dresses; they would look so great on the shutters! I really like what you did with the shutters, great rustic look. I would leave it blank and let the shutters be the main focal point. The paint turned out great and really looks old. Great job! I like how you have three twin beds in the room! My granddaughters would have loved having a room like that at Gramsy’s house! 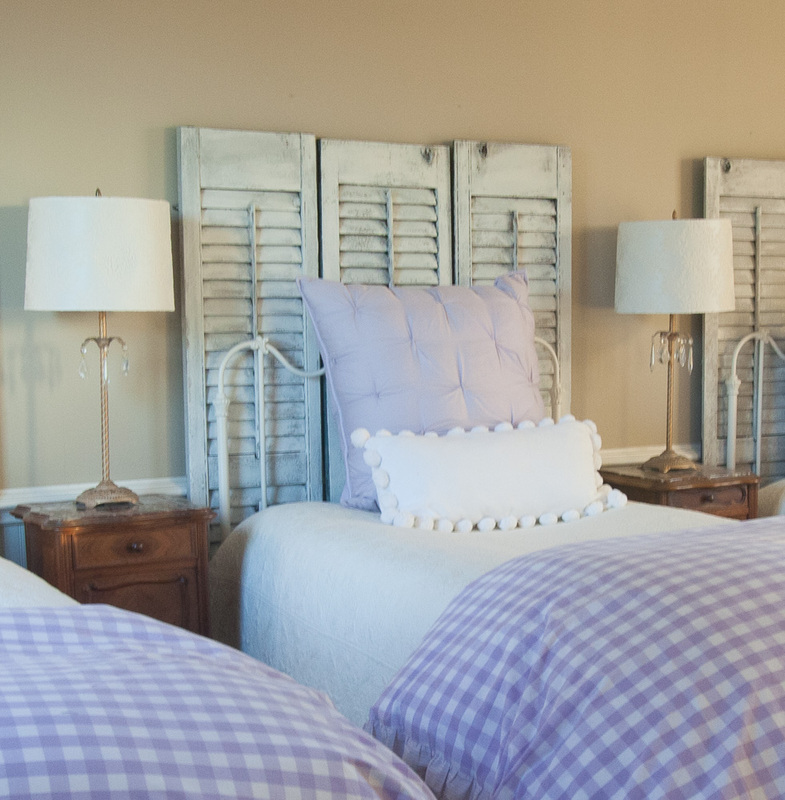 The shutters look great behind the beds! I love the shutters, you make the painting job look so easy. They look great behind the 3 little beds. I found 2 little shutters, so I’m going to give it a shot and try to paint them also. I’m going to use mine on a hall wall with a vine wreath hanging on it. What a great opportunity to decorate the bedroom for the holidays! You can hang garland or a wreath on the shutters…lots of colorful possibilities! Wow! Excellent! Hadn’the thought of using the shutters seasona)you decorated. I love the look with the shutters. Simple, beautiful! I would leave it as is. Perfect timing! I was thinking of doing the same . Now that I can see what it looks like, I will. What about hanging the dresses on the shutters? Not sure if clip on lamps and the other lamps would work– visually too much? If you put little dresses up and then hang a piece of art/saying above the shutter, it would bring eyes up and it appears taller, as you know. Maybe signage like Peace,Love, Hope? Great ideas, and the lamps on the tables could go if it was too much. Looks great! I don’t think it needs anything else. You have three daughters? How blessed! Just 2 Susan. The third bed is for a friend. Looks great, I would leave as is and decorate the shutters seasonally! I see someone else thinks like I do , little wreaths on the shutters would be wonderful for the holidays . You know this is one of my all time favorite rooms… loved it just the way it was, but understand needing a change! Very cute! Keep the shutters as they are. Don’t add anything on or above them! I think the little dresses (just as they were framed) would add so much above each shutter. Thanks for easy way to paint the shutters. Love it.. Add some little wreaths and decorate for all the holidays.. Depends on the look you are going for. I prefer the dresses. Small boxwood wreaths hanging from the shutters would bring just the right amount of warmth to the room. Love the change! I’ve been saving shutters in my she’d. Now I know what I can do with them! Thanks! I love the shutters! Great look and they turned out awesome. I love the shutters just as they are. The dresses are cute, but this is a nice change. Too many other things added to this would take away the great look that you have now. An occasional seasonal addition can be used as needed. Love this look!! I’ve always loved how you styled that room. Loved the arched frames that drew the eye up. But now I also love the shutters. I would like to see something above the shutters, maybe the frames again, maybe small mirrors, or maybe the idea of wreaths mentioned above would do the trick. I know whichever way you go, it will be perfect! I love the black wire frames behind the dresses. Do you mind sharing where you got them. I also really like the shutters. If you were to put anything above them, you could use a small curved architectural piece above each one. That would add some interest, although, they look great just the way they are. Rebecca, I sold them in my shop, but am out of stock. Hopefully, you will get them back in. I will try and check from time to time. Thank you! I would raise the shutters up higher and put those wire things on them, with or without the dresses. I like them both and think they would look good combined. I like Gloria’s idea of raising the shutters and placing the framed dresses on the shutters. I like the look of moving the eye up. Also, the wire frames provide a contrast color which would be good. I love the perfect shape of the wire frames. I love the new look. Your daughters are getting older and they’ll appreciate the little change. I loved the other look, too, but I remember growing up and how my sister and I wanted to leave behind the little girl look. I like your idea to add a light to each shutter – less bothersome to the other if one wants to read in bed. The lamps would probably need to go in that case, but there are so many possibilities for the night stands. Change is good and I’ve enjoyed each of yours so much. I can’t afford to change all of my rooms, but I can do one thing different in each. I don’t think they care Jacqueline. I personally like way you had it decorated previously. I am sure you could use the shutters in another creative project. Great new look. I like it. Could you post a pic of the dresses on top of the shutters, and another with them above the shutters? You have wonderful ideas! Shudders look great, adding a small delicate scrolled grill above the shudders….in natural iron, white or lilac…would top it off! I really like the updated look with the shutters. I would leave plain for that ” fresh,clean” look, and then hang a wreath or stocking on each for Christmas. 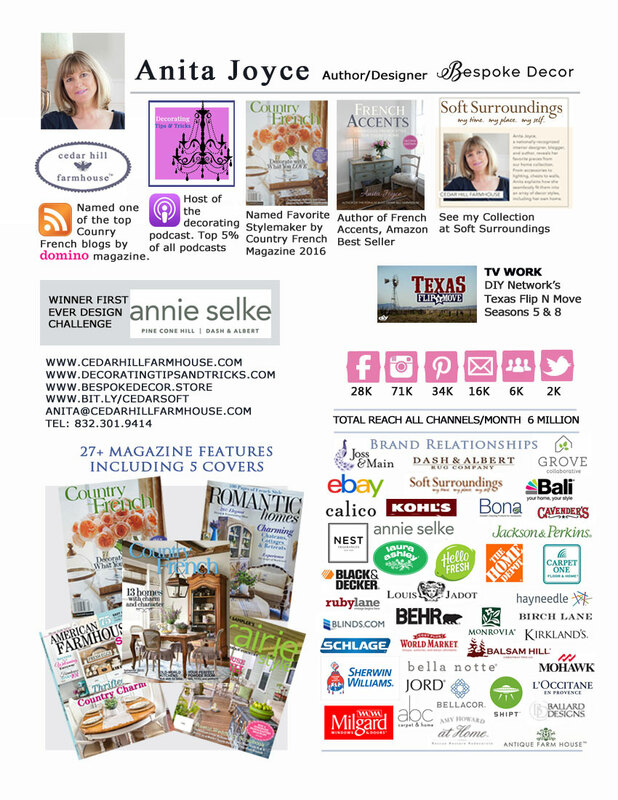 Each season could be represented as it arrives and give the room a fresh focal point. Hello, I understand the need for something different-BUT since you asked-it seems like you’ve taken the stunningly unique personality away. And I love shutters, too, and they look lovely behind the bed. It just looks like an ordinary decorating job found on any blog now. I’m sure you’ll find a way to bring back the wow factor! Maybe something individual to each girl..such as a wood sign with their favorite saying or quote? 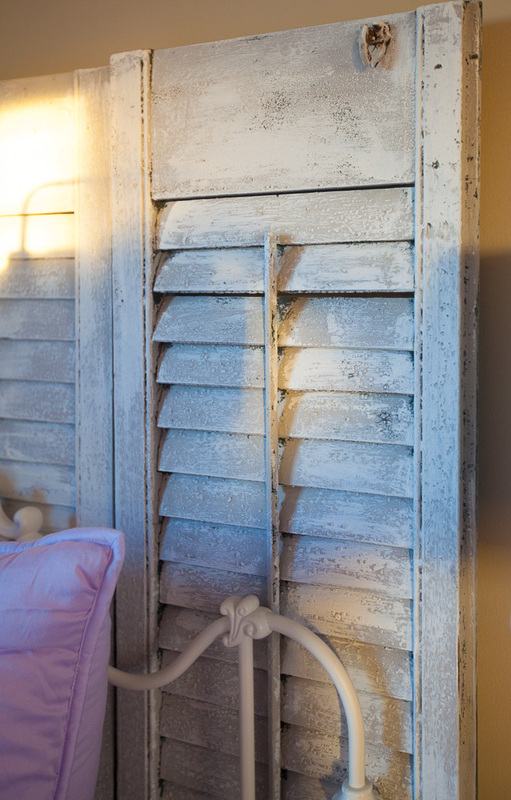 I love the simplicity of just the shutters alone… so refreshing. This way it also looks like it is not just for kids. I really like the shutters behind the headboards. I would think about putting old (looking), worn signs above each bed. They could have the girls’ names, or sayings (Girls just want to have fun! ), Scripture, French phrases, etc. Always look forward to your posts, Anita! Love using shutters inside the home!!!!! I found a pair for 1. 99 a piece at Goodwill! Took them home and did the same kind of treatment to them!!!!! Love how they turned out!!!!! Yours look amazing behind the beds!!!! Beautiful as always!!!! Roxann ? Love the shutters! I have some I e been saving for??? Now I know what I’m going to do with them! I might be tempted to try small box wood wreaths on ribbon hangers on ea of the headboards…. I like both looks and I understand about needing change every now and then….it all looks great. Gosh, just love both ideas. With the shutters I’d remove the lamps and put those farmhouse looking hanging lights on each bed! You can always change the look a bit at a time and enjoy each way a few months at a time! I do that in my bedroom and it feels really good to have more than one look. Love everything you do! Love the shutters idea….I have always loved them…anyway, I think some scrolled iron pieces maybe painted white might work placed above the shutters. Also, what about hanging the little dresses on top of the shutters…just a thought. I know you will work at it until you get it right! Love the shutters too! I am working on some shutters also. I have a set of two, with two shutters on each which are wooden. I also have about 4 more plastic single ones that I have been using as backdrops in my shop, plus they are great for hanging things on , lie wreaths, etc. So many ways to attractively use shutters!! I also have a couple of sets of short ones, but they have not been painted yet. I saw one the other day that had doilies displayed on each rung, however, with a middle section down one side, mine wont work for that,so I am junking for a wooden ladder. 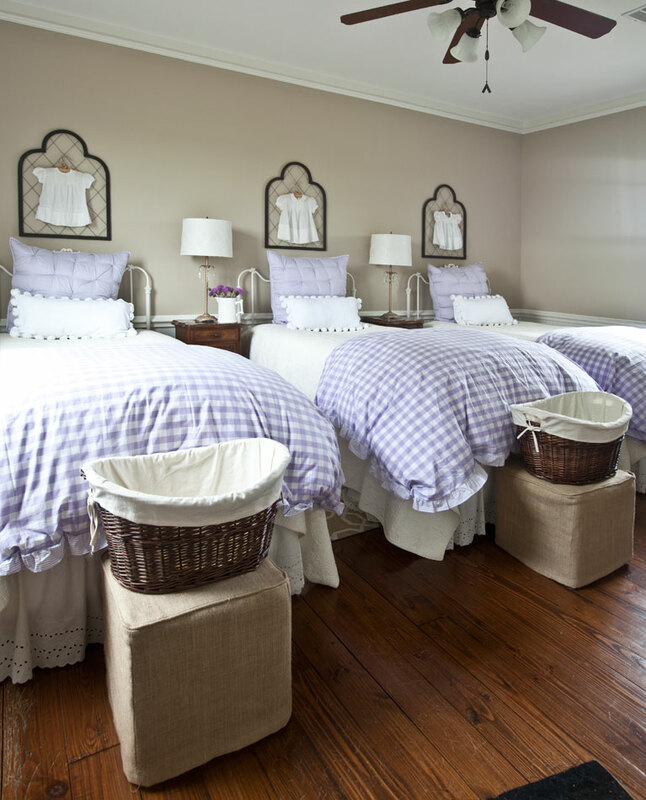 LOL I love,love, love the little dresses, but the shutters look great like that behind the beds. It goes well with the colors and pattern you are using! Very pretty and a great idea!! The shutters look great, so much character- I loved the little dresses, too. But I agree, sometimes you need a change. Hi Anita, I really like the shutters. Did you attach them to each other and /or to the wall? Have you thought of hanging the dresses with the wire on the middle shutter. Don’t know how it would look but you could hold it up to one and see. Just an idea. Have you thought of hanging the dresses with the wire on the middle shutter. Don’t know how it would look but you could hold it up to one and see. Just an idea. Love the shutters like they are. Hang the framed dresses on the shutters!!! Well, I guess I’ll be painting some shutters! Love them…maybe an airy wreath could be put on them. Love them…maybe a small airy wreath would look good. I always loved the dresses. The shutters work but I would want to hang them higher on the wall. Then maybe hang wreaths or something else. Hello Anita , the room is darling. I especially like the checked duvets. Would you mind sharing where you purchased them. 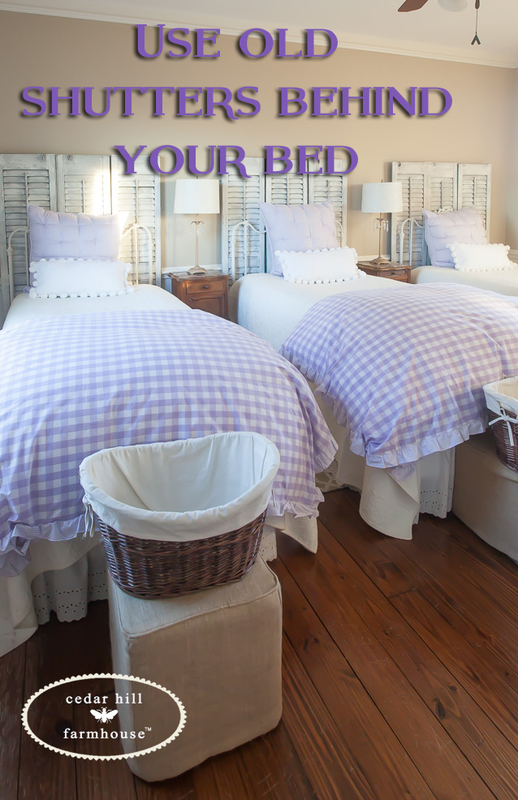 I adore this look behind the trio of beds! Inspiration! 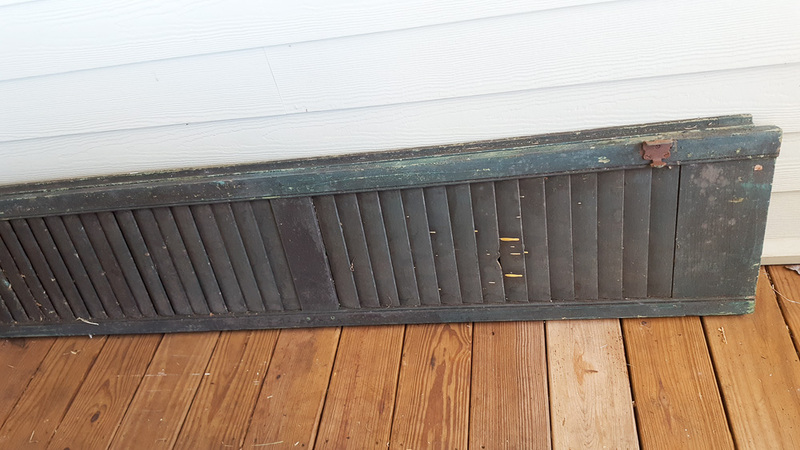 I saved about a dozen small shutters from an old home in our tiny town and I’m looking to do something with them. The new owners were putting them in the trash, but when I asked they were kind enough to let me rescue them. They may be too small for this project, so I’m looking for ideas. Personally I like the just the way you have them, nothing on top of the shutters!! Great job!! ?? I love the shutter idea, but the previous design is my favorite. Love the dresses!!! What do the girls prefer?? Love the look of the shutters…just not the color. 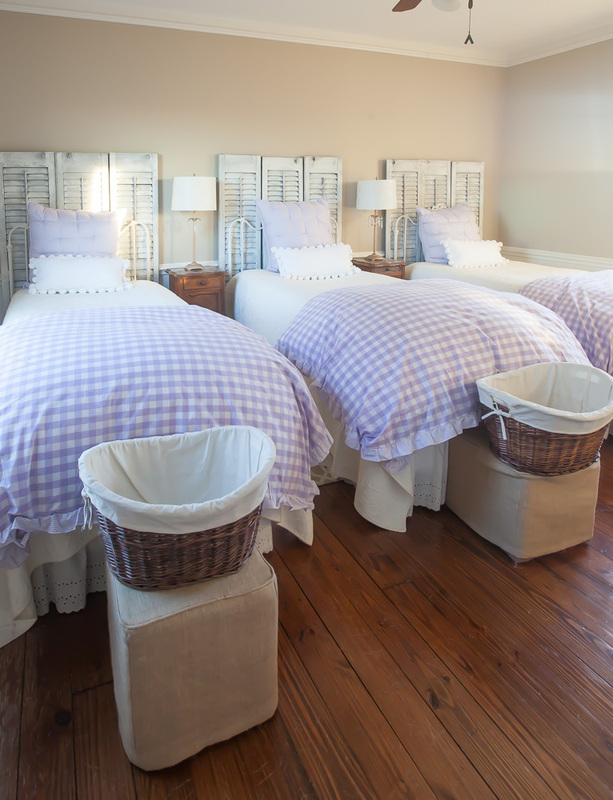 I feel they would stand out more is they were a pale lavender to match the comforter. Nice look though! I like the idea of boxwood wreaths for now and then after the holidays I’d use the dresses. They were one of my favorite things. 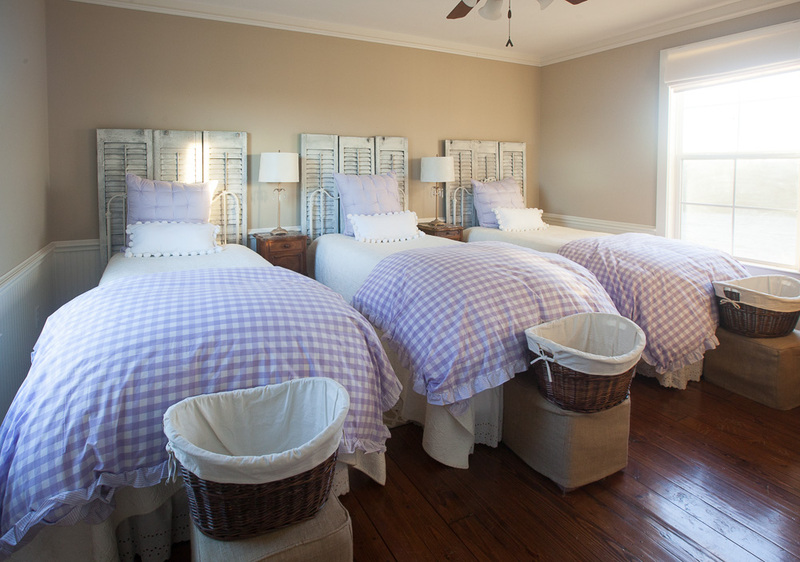 I love the refined and repetitive look of the 3 matching beds mixed with the rustic shutters. What if you raised the shutters up on the wall and put the dresses on the shutters at the same height they were before. That would add so much texture and keep your personal touch. Well, I knew the day would come – don’t like these. It’s hard for me to type this because I love everything you do but this one fell flat for me. Just blends into the wall. Can we agree to disagree? I like both looks but regardless I agree totally that change is good. Live with the shutters for awhile then reassess the look. 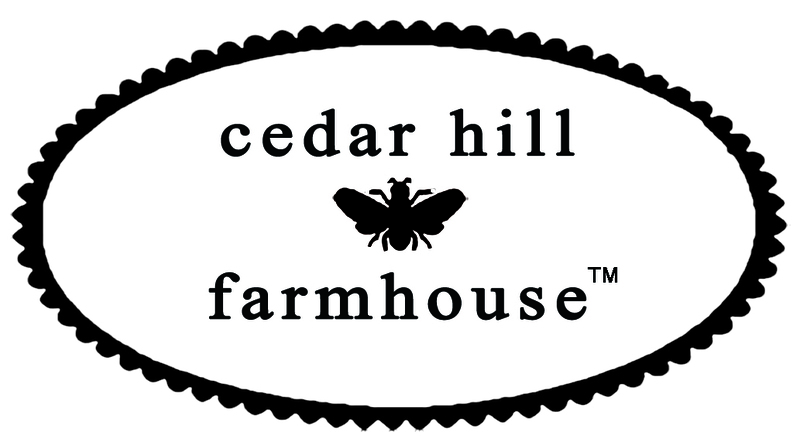 I see smallish boxwood wreaths……..
Hmmm love it both ways, so hard for me to decide. Do love the way the shutters turned out. I love this room, Anita! Nothing! Leave just as they are! I’m for the decorating the shutters for the holidays. First time here, first time I’ve seen the dresses. Love them, but you’re on the road to change. “Dress up” the shutters for the holidays! Thank you Mag, and that’s a great idea! It really changes up the room. I didn’t notice they were the same height until you mentioned it. Love the idea of the clip on reading lamps. If I hadn’t seen the room the way it was before, I’d say this looks great. But, it seems to be missing something special here. Some of the ideas presented perhaps? I’ve always loved shutters like these, though. Looks great just the way it is. Love the shutters! 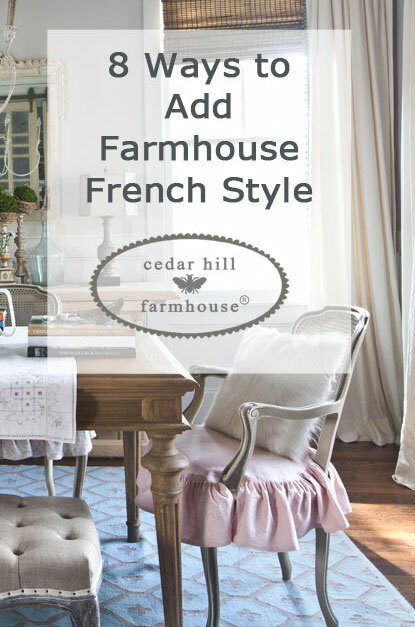 Great idea…I actually bought some shutters at Round Top brought all the way back to SC, then we realized they wouldn’t work for the project I had in mind…They weren’t the good old shutters you had though! I loved the black wire frames that you used before with the dresses, in fact I liked them so much I bought one from you. There was a great contrast on the wall,it popped. I think you need something on the shutters, a great look but there is not any contrast. Perhaps a wreath on each shutter. The dresses could be framed but that is expensive, I had my mother’s christening dress professionally framed, preserves and looks great. You are talking about three dresses. I wondered why the shutters could not be hung higher over each bed. I realized that you have them propped against the wall. You are the expert and you will come up with something great. They came with the baskets Marilyn. love the shutters! maybe add a bit of random chippy architectural piece above them?? but they look darling alone, also. I agree, sometimes you just have to have a little change. I’m going up to my attic and dragging down my shutters! ha! The shutters add such a warmth to the room. I agree with so many others, that decorating on or above them seasonally would be so fun. 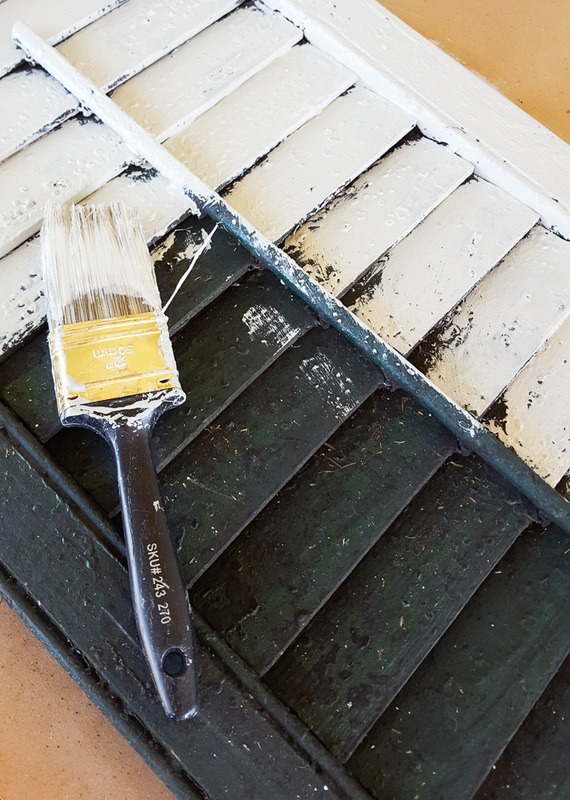 I have some new shutters that I picked up at a garage sale and I’m working on painting them for that great distressed look. Old and chippy is so much better. I am in love with the girl’s room! The headboard shutters look awesome! The shutters were inspired. I wouldn’t put anything above them unless you do a swag thing that says something like hope, or love, or something like that. To put something above the shutters just because would ruin the effect. The dresses are really special! Good luck! I like the shutters and paint, nice to have a change. To me the shutters need to go up a little on the wall but the bottom of them still come bell w the headboards. I get giddy over shutters. 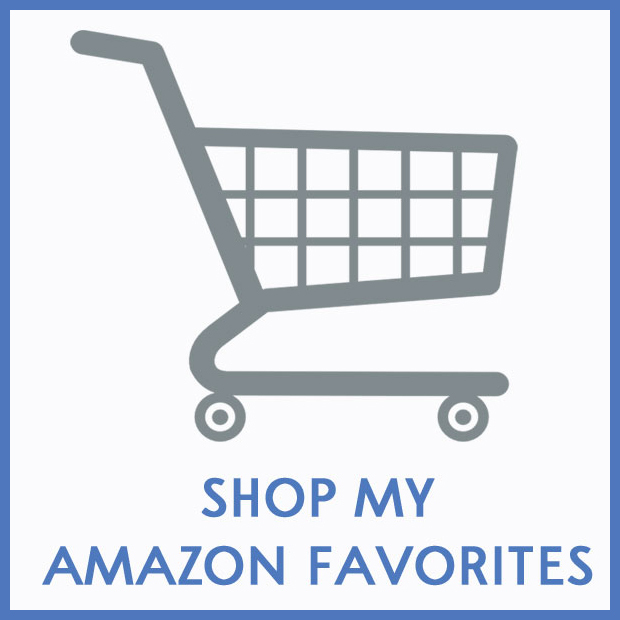 Buy them frequently when I can find and have them all over my house! I suggest you hang a popping cloth swag and a wreath made out of feather plumes. I absolutely love all of your ideas! Like you, I love both the little dresses…….and the shutters! 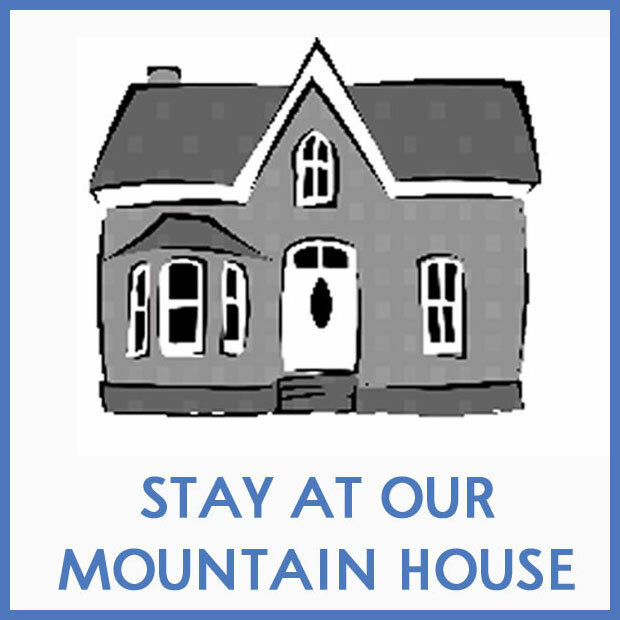 Have you thought about putting up the dresses over the shutters? (using the shutters as the wall)? That way you get both the things you love in one! I love the shutters! What a marvelous way of decorating a bedroom. I would never have thought to use them like that.So creative!! I must be living in the hay loft Or I don’t get out that often. Amazing.haha Keep up with the beautiful ideas Anita and keep throwing your inspiration my way. Love it!! Smiles from Tn. Ha, I sometimes think I don’t get out enough, so you are not alone Mariann. Hi Anita. It’s me again. Just wanted to let you know what you’ve inspired me to do. I have a big bathroom upstairs with a toilet in a room of its own. I’m going to place 2 of my shutters on the wall (painted with some white chalk paint) facing out with a little table in front and on that table a nice wicker basket with rolled towels.Maybe a few bars of homemade soap sitting around. I also have a beautiful little heart flower wreath that I will put between the center of the shutters. I think this will look delightful.Now to get that table!! And to tear the shutters off the front porch. Smiles again from TN. Love dresses and the shutters. I have the shutters behind twin bed with plates hanging over them with the idle plates higher to add height. Love all your ideas! 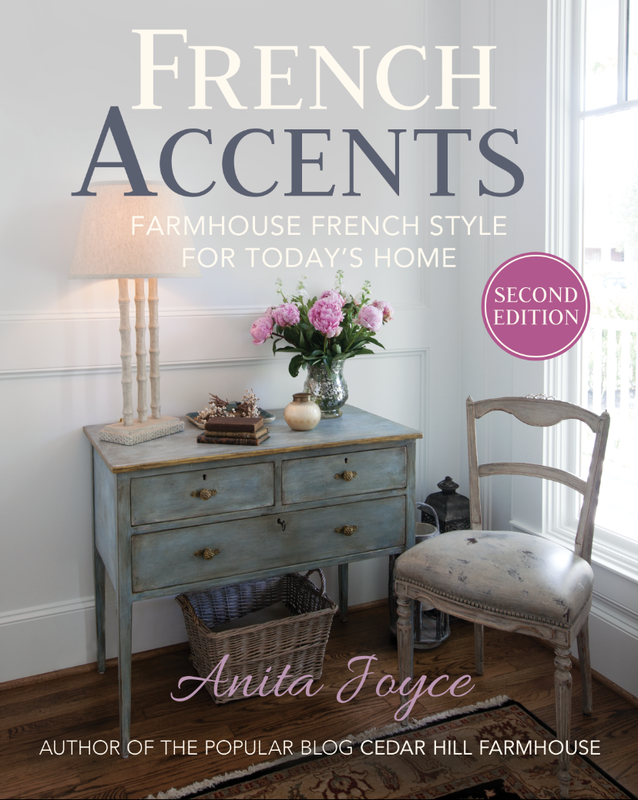 I’m new to your blog, I’m decorating my remodeled home- ‘old world-country french meets the wild west’. I love your style. I’ve been struggling with one of the guest bedrooms. Shutters will really add personality it is greatly lacking. I knew there was a reason I saved the old shutters. Thank YOU!! Yeah Monique. Go for it!!! I’ve been following you for a while and love your work! I’d like to put three twin beds in our grandchildren’s room much the way you have done here, but I’m not sure there is enough room for me to do it. Would you mind sharing the dimensions of this room? We currently have a “L” shaped bunk bed in this same room and we both hate making it! Any suggestions would be appreciated! Judi, that is at our farm, and I am in the city, so I don’t have the measurements for you. But even better, I suggest you put some tape on the floor where the beds will be or some boxes and see if you have enough room to maneuver. Each person has to decide how much clearance she wants between beds. Based on my experience, what works for one person doesn’t work for another. What looks crowded to one person seems cozy to another. I hope that helps.